Anticorrosive coating tape is used as the base material which is coated by the liquid butyl rubber film, both of which are pressed and compounded. It is mainly used on underground, underwater and overhead pipelines. This coating system is made up of liquid adhesive, inner layer tape and outer layer tape. The total thickness of the system consisting of inner layer tape and outer layer tape may vary, depending on pipe diameter, operating conditions, and installation conditions. In some cases, more than one application of inner layer tape and outer layer tape may be used. The total thickness and combination of the various layers used is discretionary with the purchaser, with proper consideration given to the manufacturer’s recommendations. The liquid adhesive consists of a mixture of suitable rubber and synthetic compounds and a solvent. 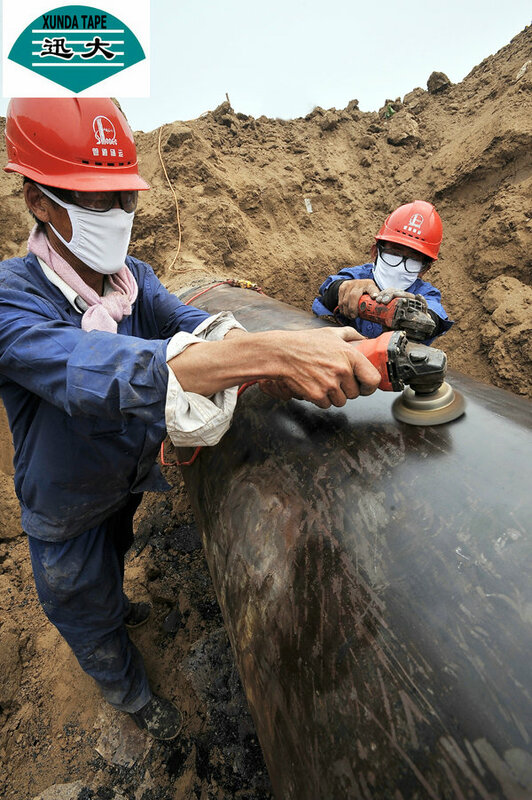 The liquid adhesive shall be applied to the properly prepared pipe surface before application of the inner layer tape. The function o the liquid adhesive is to provide a bonding medium between the pipe surface and the inner layer tape. The outer layer tape shall be a two / three layer tape consisting of a polyolefin backing layer with a laminated butyl adhesive layer. The primary functions of the outer layer tape shall be providing mechanical and outdoor weathering protection to the tape system.